Coloriffics has a certain knack for creating timeless evening purses for less. This vintage-inspired satin clutch is just another example of the stylish looks we've come to expect from the brand. Crafted from white satin, this classic purse is jazzed up with a scrolling splash of floral embroidery and a dash of glittering rhinestones. The design's a little old fashioned, but with vintage enjoying a resurgence many girls won't mind a bit! Most of us have reservations about white purses, but that needn't be a concern here. Coloriffics assures us that the purse can easily be dyed any hue of the rainbow! That would make this purse the ideal accompaniment for your favorite evening outfit. And I can't think of a better way to disguise a little dirt or a red wine stain! Like so many evening bags, the features are limited. There's enough room for cocktail party must-haves, but you'll need to leave the luxuries at home. A tuck-away silver shoulder strap takes up some of that space, but you'll be thankful for it once the night wears on. At $37, this sweet satin purse is an inexpensive way to enjoy several evening looks! 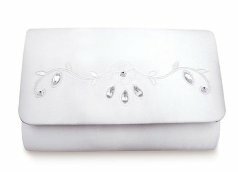 The Coloriffics rhinestone frame bag, a great alternative to this satin bag.